I'll admit it: I suffer from a lack of recall. Certain friends tease me that our friendships stay fresh because no matter how many times they tell me a story, it always seems new to me. Forgetfulness muddles even my culinary memories. What did I have the last time I dined at Chez Panisse with a big group of friends? I remember swooning, rejoicing in every bite, and declaring that this place always lives up to its lofty reputation. But what did I eat? Without my more recollection-gifted friends (or a heisted menu), that information would be lost to the mists of time. On the rare occasion that a food memory sticks, you can bet that the dish made an exceptional impact on me. The impression may have come from just a single detail. Take, for example, the fruit tarts from Les Petits Mitrons. These tarts, from a patisserie not far from our apartment the year I lived in Paris, had a look more rustic than refined, with thin, crisp, wavy-edged crusts that were cooked a little on the dark side and were just sweet enough, thanks in part to caramelized demerara sugar on the bottoms. My favorite was the orange-and-grapefruit tart, with its plump, juicy, intact sections held in check by a thin, shimmering glaze. But that single detail of the crust, its sweet crystalline crunch, seared those tarts into my mind forever. 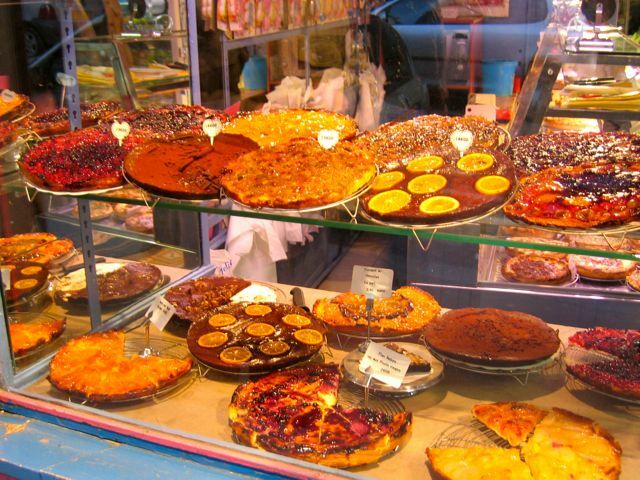 [%image tarts float=right width=400 caption="The pastry window at Les Petits Mitrons. "]Sometimes a dish brings to mind certain people. I can’t drink a glass of sangria without thinking of my mother and father, who served pitcher after pitcher of it at summer parties they threw when I was a young kid in the 1960s. I remember them and their friends talking and laughing and letting loose, sailing between the big, airy living room and the deck suspended high up in the woods. Even at the ripe old age of six, I had a vague notion that the sangria was fueling it all; Mom and Dad's faces and the whole party scene come to mind whenever I make a batch of my own. One of my strongest, clearest food memories is of my first encounter with ajo blanco con uvas, or cold Spanish garlic-almond soup with grapes. It made an indelible impression not for a detail, or for a person, or even for a single feeling. Ajo blanco con uvas gave me a whole new sensibility. I was 13 and spending the summer in San Francisco with my sister and her then-boyfriend/now-husband. I was an enthusiastic eater, but hadn’t yet latched on to food as a driving interest. Up to that point, I’d been exposed to pretty standard upper-middle-class suburban fare: steaks, burgers, and pork chops on the grill; lamb chops with mint jelly; meatloaf; salads with Good Seasons dressing; deli sandwiches and takeout pizza; and the occasional shrimp with lobster sauce and egg foo yung at the local Chinese restaurant. Those weeks in San Francisco shook loose the suburban culinary shackles with several great food moments: my first fresh fig, eaten at a wholesale produce market in Bernal Heights; icy paletas in the Mission; and grilled five-spice chicken at a Vietnamese place somewhere just off Van Ness. But the dish that really made my head spin that summer was the cool, creamy, lush garlic soup with grapes that my sister made. Their apartment wasn’t far from Japantown, on a short side street off Fillmore, which was still rough around the edges in those days. The kitchen was at the back of a long hallway, with a pantry off to the right and a fire escape out the back door. My sister, a devoted food person with formidable instinct and tremendous talent — and focus to match — spent much of the day cooking for a bunch of friends coming to dinner. Not surprisingly, I can’t tell you about any of the other dishes on the menu that night — probably because I was so riveted by the soup. It had just six ingredients, not counting the grapes or salt, so it was simple. But the combination of temperature (cool), texture (velvety), and flavor (earthy, elemental, and confident) gave me my first glimpse of how sophisticated the right mixture of simple ingredients could become. "Suave" is the best word to describe the overall effect of my sister's soup. By the time I reached the bottom of my bowl, I felt like a whole world of new ingredients, techniques, and possibilities had opened up for me. 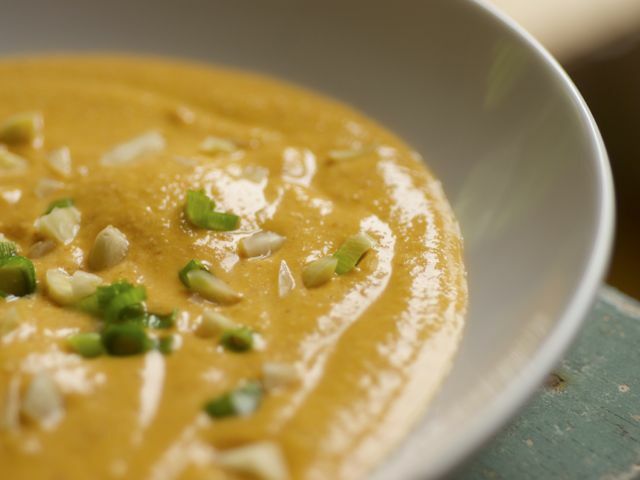 In the decades since that bowl of soup, I’ve traveled to Spain and read up on its cooking. Now I know that bread-thickened soups are common in many regions, and they can be served both cool and hot. Last year, as the moment for cool soups was passing here in New England, I worked out a version of the recipe to serve warm. With the same hallmark flavors and characteristics, this one is punctuated with shrimp and one of my favorite Spanish ingredients, smoked bittersweet paprika. The new version with shrimp and paprika is welcome and warming, to be sure, yet it still can’t quite match the impact that its cooler ancestor made on me in the summer of 1977. I still make ajo blanco con uvas a couple of times each summer, and I never cease to marvel over the stuff, always stopping for a moment to recall that first bowl in San Francisco, and the world it ushered in for me.